I guess I finally found something that chickens do better than ducks -- eggs. As I wrote in an earlier post, I recently became a lucky recipient of a dozen duck eggs. So this weekend, I tried duck eggs for the first time. Following the advice of Walter Jeffries (from Sugar Mountain Farm), I dropped my first idea of deviled eggs in favor of an omelet. It wasn't as fluffy and light as a chicken egg omelet and had a more pronounced sulfur smell. Not bad, but not something I would make again. But wait! I didn't give up that easy. My second experiment was to make a soft boiled egg -- my favorite kind -- with the yolk still liquidy. I have to admit that I undercooked the egg slightly. Soft boiled eggs are always tricky since a lot depends on the size of the egg and there is no way to check them. The yolk came out really viscous and too thick for my taste. My husband, who doesn't eat eggs, was documenting my little experiment and laughing as I tried to come up with more ways to cook duck eggs. Determined to give this one more try, I set my trusted cast-iron skillet on the stove, and cracked another egg into it for sunny-side-up. The white cooked really quickly, but I had a hard time getting the yolk to warm up. I tell ya -- that was one huge yolk. Just like with soft boiled egg, it came out too viscous. Of course, what I probably should have done is baked, not cooked with them. But since I don't bake much, I haven't tried it yet. The moral of the story is: All that glistens is not gold, and all that is duck is not necessarily better than chicken. That's some moral. Thanks for sharing the experience with us. So, how many eggs do you have left. Will you continue looking for a good recipe for the eggs? Thanks for the comment. I really enjoyed looking at your blog and look forward to later posts. The photos of your food are great as well. Check out previous entries in my blog for food stories; my dad is an amazing cook. P.S. Where do you purchase your produce? My family does nearly all of our shopping at The Whole Food Market. Do you? *grin* I'm glad it isn't just me! I never have gotten to liking them boiled and even as fried they seem strange. However in baking they are excellent. My very favorite thing to do with our duck eggs is meringues - duck eggs have so much white in one package. I think the sulfur smell is in the yoke so that solves that. I end up giving the yokes to the dogs, great for their coats, unless I have an immediate use for them. I guess its a question of taste. Personally, duck eggs, or at least those I tried in China, are my favourite eggs. Were the duck eggs organic? The sulfur smell is probably from being fed non organic commercial feed. Our ducks are pasture fed, and also fed certified organic feed... the eggs have hardly any smell at all when broken. Before giving up duck eggs, might I suggest trying organic, first. Came across this aging post while looking for recipes for some recently purchased duck eggs. The sulfurous odor is known as the "rotten egg" smell. It doesn't matter whether the egg is from a chicken, a duck, or an ostrich. It does not have anything to do with organic feed. You got an old egg, probably inadvertently, but still rotten. Did you talk to the purveyor? The moral is, if it smells rotten throw it out and start again. I'd just like to add my vote in favor of duck eggs. I have four Muscovy ducks, three of them females, all considered pets. Almost a year old now, the girls recently started laying a couple of eggs a day, and so I've had the opportunity to eat fresh duck eggs both fried and scrambled. I find that duck eggs need gentler cooking because of the size of the yolk, but I find the taste to be excellent -- similar to that of chicken eggs but richer. I am suprised at your comment about duck eggs. I too have some muscovy ducks and I was basically giving away my eggs until I finally decided to start using them and boy am I happy I did. I don't use my chickens eggs anymore for making omelets. 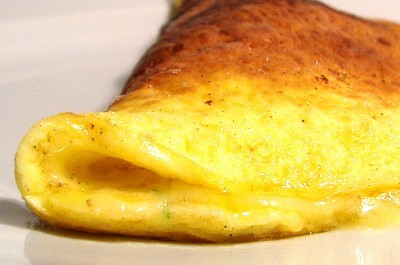 The difference is AMAZING with much fluffier omelets and oh so good. I too think you had a bad egg because what you describe is not normal for a duck egg and am not sure how you prepared your omelet. I usually use one or two eggs to make an omelet (feeds 2 or 3 people) and whip the egg with a fork, add some milk or cream, add whatever I am going to put into it, fried bacon pieces, onions, red/green peppers, etc. etc. One in the pan and almost set I add grated cheese, then fold it over once cooked (don't overcook) remove from stove top and put a top on fry pan in order to make sure the cheese melts and VOILA! Best omelette you have ever had I can guarantee. We started getting duck eggs from our neighbor and they turn out great for scrambled or over easy. We love them our scrambled eggs were very fluffy I even drop a few into a greased hot skillet and scramble them right away and have a scrambled egg sandwich with Miracle Whip...yum. We know have a mixture of ducks and chickens ourself. I loved reading what yall had to say about duck eggs. I go to this chinese store in memphis to get diet green tea and I bought some duck eggs. I havent tried them yet. It says they have been boiled already so should I boil them again. duck eggs are marvelous. truly culinary wonders that leave chicken eggs in the dust. if there is an issue with sulfur or whatever, you probably didn't get a good batch. look for organic and truly free range duck eggs. you will never go back to chickens of any kind. and ignore those who are wont to cast judgment after one bad try without giving something a fair chance. our palettes should not be held hostage to such small minds. I am looking for duck eggs to make Chinese Salty Eggs (eggs stayed under concentrated salty water for 1 mo.) ... Where is the small farmer in MA?